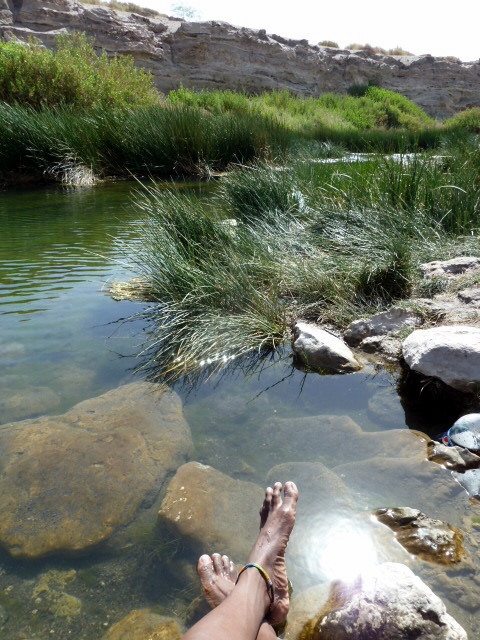 Soaking my feet in the Loa River. The Loa is a U-shaped river in Chile's northern Antofagasta Region. At 440 kilometers long, it is the country's longest river and the main watercourse in the Atacama Desert. The waters are freezing in winter and cold in summer. I tried to venture in, but only did up to my waist. It wends its way from the Andes Mountains through some of the most scenic country anywhere on Earth. It's interesting that it also cuts across the Atacama Desert, the driest place on Earth, with virtually no rainfall. Most days the skies are a bright blue and it's very sunny. I've seen various stretches of the Loa River over a period of time. In some parts, it runs lazily, in others it moves fast, and still in other sections it cascades over huge river bed boulders. It is the lifeline of the Atacama.